Hangin' Tree Cowdogs are a very versatile breed of dog. They are bred with a lot of natural instincts for working around cattle. Some of the cowdogs have some bark and they use their bark in an intelligent way. The bark is a means of encouraging cattle to move on up in a gathering situation. The bark can be an effective means of moving cattle forward into a trailer or up an alley to a chute. 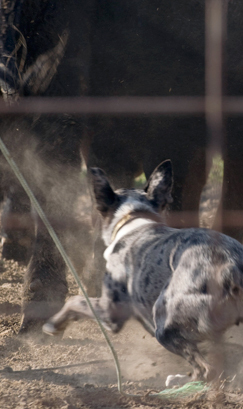 The bite or grip to the nose is the cowdog's method of turning or stopping the direction of travel for the cattle you are moving. The bite or grip to the heels enforces the cowdog's desire to move the cattle forward. I use my cowdogs in a variety of ways. I can send them into brushy, hilly and rocky ground to hunt or look for cattle, gather the cattle up and then bring the cattle to me. The cowdogs are trained to bring the cattle to me and it is my job to be the guide of where we want the cattle to end up. Cowdogs with more experience can be sent on a gathering mission at the gate of a pasture and the dogs know that the goal is to bring the cattle to the corral or trap where the work is going to be done. There is great value in having a cowdog that can think about his or her work situation and get the job done without creating a wreck and a stressful situation for the cattle (and the handler). Here at Tammy's Cowdogs, the dogs selected to be breeding stock must demonstrate they can bite or grip both the head and heels. I want the breeding dogs to be effective in how they work cattle. The dogs must also be willing to be called off the cattle or retrieved easily. Being a good listener as well as a good thinker are important traits in a cowdog. The dogs have docked tails and are short or slick haired. When selecting a cowdog, you should remember that "one size does not fit all". This simply means you should consider things like the type of cattle operation you have, the cattle work or jobs you want to accomplish with your cowdog and the type of personality you have. Some bloodlines and matings may be a more compatible fit for what you are looking for or truly need in your cattle operation. If you have any questions about the breeding program, the certification of litter registration or permanent registration of Hangin' Tree Cowdogs, please contact me. I'll be glad to visit with you about your cattle operation and give you some insight into selecting and buying a cowdog for your operation.